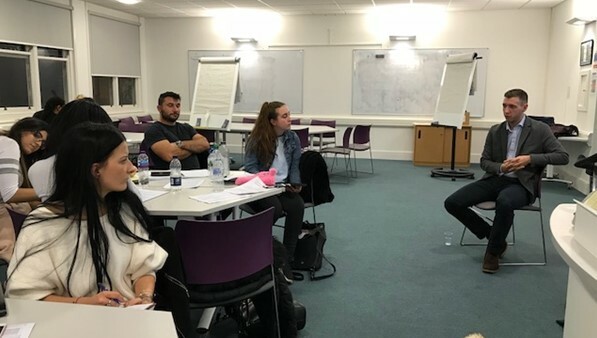 As part of the Client Interviewing Workshops we were joined by Brighton University alumnus Daniel Dickson, now a solicitor at a local Brighton firm, Rix and Kay. Daniel offered an insight into client interviewing and its importance in dispute resolution. This also assisted with advice for the Client Interviewing competition which we are currently undertaking. Daniel highlighted the need to build rapport with your clients as this is fundamental in building a relationship of confidence and trust (which it makes it easier when asking those intrusive questions). It is important to establish your clients “wish-list” but also manage their expectations. This includes ensuring your client understands the uncertainty of a timescale, as things change as the process develops and, unfortunately, this can hinder progress thus prolonging their case. Your client should be absolutely certain on the costs (and subsequent fees incurred as a result of delay, for example) as misunderstanding can cause friction in your client/solicitor relationship and ultimately you could lose clients. It is imperative you do not offer legal advice on a practice area you are unfamiliar with. However, this does not mean you cannot offer practical advice to your client or signpost appropriate avenues. You can also contact your colleagues who are more knowledgeable on the topic (as you do not want your client to feel you are not worth your fee). Daniel also stressed that sometimes, the strict ‘legal answer’ is not always the best approach. It’s always worth considering what the client’s ultimate aim is, and how best to achieve that. It is important to keep your composure. Some issues are driven by your client’s emotions but you must remain professional and take emotions off the table. You are there to offer legal advice. That being said, you can be understanding and empathetic – you are not an emotionless automaton.